Americans have always been smitten with folklore; be it Paul Bunyan, Johnny Appleseed, or Davey Crockett, we just can’t help ourselves. The national pastime is no different, full of guilty pleasures that seem harmless, but still distort reality. You’d be hard pressed to find a baseball fan who hasn’t heard the tall tale of Abner Doubleday; you know that ole’ Civil War hero who “invented” baseball in a cow pasture. After all, the Hall of Fame was established in his hometown, Cooperstown, New York right? While the HOF does reside in upstate New York, even they don’t credit Doubleday as the father of baseball anymore. Still, if you mention the iconic name at any ballpark across the country you’ll likely get that same reaction from older fans, a byproduct of special interests that played a good game of wagging the dog a century ago. In the early 1900s baseball’s origin was murky and controversy struck a chord with certain patriotic bigwigs as rumors surfaced that that our “national game” might have English roots. While cricket and rounders may have been popular across the pond, sporting goods mogul Albert Spalding felt it advantageous to make sure baseball was an “American” sport invented by an “American.” Spalding organized a “fishing expedition” to solidify baseball’s roots once and for all—well, sort of. Cue the dog and pony show; an exercise headed by The Mills Commission (essentially Spalding’s drinking buddies). These crack investigators erroneously proclaimed Doubleday the brainchild of baseball after the flimsy testimony of one man who claimed to witness Doubleday’s notes. The findings, lackluster to say the least, satisfied Spalding’s appetite, so he deemed no further investigation was necessary. For a good part of the 19th century the media bought the hype and sold it to a naïve public who still believe the story today. It wasn’t until 1953 when Congress declared Alexander Cartwright as the inventor of baseball some 60 years after his death that set the record straight, but to be honest casual fans didn’t blink… Doubleday was their man. Major League Baseball was committed to Cooperstown, and so were the masses. Though thoroughly debunked, the hoax lives on today in modern lore. Whether you want to believe the Doubleday facade was fabricated to boost morale, or created with ulterior motives, it was an agenda. To this day good albeit gullible people believe that Doubleday invented baseball. MMA is no less a casualty of the times; the victim of propaganda. Of course Dana White didn’t invent MMA and doesn’t claim to, but how will the history books (blogs) remember his contributions 100 years from now? When Zuffa took the reins in 2001 they sold gullible sports journalists the idea of Dana “White Knight,” MMA’s great savior. Negative press haunted the UFC from its inception, so new ownership simply didn’t want painted by the same bad brush. Who could blame them really? Like Spalding, The Fritetta brothers had a vested interest to protect their investment, secure a legacy and promote a mainstream “sport.” Zuffa’s strategy was simple: Strike first, strike hard, show no mercy. Cookie cutter press kits quickly circulated across the country that subtly seemed to rewrite MMA’s timeline. Strike First: They say it takes only one-tenth of a second for people judge someone and make a first impression. White’s “I built this thing” image was immediately imprinted on the minds of millions of impressionable MMA fans. Zuffa gave the illusion of Dana rolling up his sleeves to hash out “new” rules with Athletic Commissions in an effort to make the UFC more palatable. By definition, its “rules” that transform an unorganized activity into a sport, so if you take credit for those rules, ipso facto you are loosely saying you created the sport without coming out and saying it. It was a brilliant albeit misleading marketing campaign that became self-sustaining once enough reputable publications ran with the story. Strike Hard: The new UFC unleashed an aggressive “out with the old in with the new” media blitz. Reporters printed, and reprinted and reprinted the same UFC hoopla over and over again without hesitation or regard for investigation. They’d have you believe MMA was the Wild Wild West until Dana strode into town with fistfuls of law and order denouncing spectacle and praising sport. Zuffa launched the famous “They ran from regulation while we ran towards it” publicity tour that buried any headway made by Bob Meyerwitz, SEG Entertainment, and the New Jersey Athletic Commission, who in fact had laid all the groundwork. Beat reporters more adept at chasing pucks and balls gobbled Zuffa’s history lesson and regurgitated the message for casual readers to digest. The “Zuffa Zombies” were fed Dana’s “White” lies and the general public swallowed them whole. Ladies and gentlemen, if it says so right here in the newspaper that Dana White created the rules for MMA, it has to be true, right? Dana was crowned the Czar of MMA. While his contemporaries Bud Selig and Roger Goodell regulate sport, Dana is the sport. Show No Mercy: Just like that, Art Davies and Rorion Gracie’s UFC was now the proverbal English cricket and SEG Entertainment relegated to rounders, both distant cousins that didn’t resemble modern mixed martial arts—at all. More important, your local tribune or gazette told you so. Truth is Dana and company simply adopted an infrastructure that was already established by the previous administration (but that certainly didn’t make for good copy). To their defense, they probably didn’t see much harm with adding a little pizazz to the press releases, after all the odds were against MMA breaking through the ceiling, but it did. While savvy MMA journalists like the folks at whaledog.com and ESPN’s Jake Rossen exposed the “Zuffa Myth” time and time again, their efforts in some way were too little too late. Dana’s “first” impression was and is forever embedded. If we’ve learned anything from baseball’s narrative, Abner Doubleday became the media darling, and so the “Zuffa Myth” is poised to be the version fans tell their grandchildren. As time marched on, seemingly innocent embellishments a decade ago intensified to create “Dana Doubleday,” the be-all and end-all of MMA. This version of Dana White is media endorsed exaggeration that has permanently blurred historic lines. 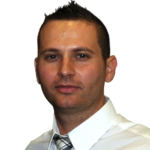 White was able to parlay a longshot into a multi-billion dollar industry, launching MMA into the stratosphere. That of itself makes him a winner. He deserves a lot of credit, just not all the credit. As pre-Zuffa contributions continue to fade away into obscurity, so do the pioneers who fought in the trenches to establish a sport, much less the trailblazers who paved the way before the UFC. Innovators like Bill Viola and Frank Caliguri (the first to test drive the sport) aren’t even in the conversation, but do deserve a voice. Is MMA following the dark path of “Doublethink” mentality? Everyone from Art Davie to Dana White and all in between can thank the Pennsylvania state legislature for banning MMA in 1983, because without them the UFC as we know it would have never existed. But Dana White isn’t losing any sleep over MMA’s forgotten forefathers; he was able to cash in on a diamond in the rough. He didn’t steal the gem; he just polished it and did a damned good job. Just don’t forget that treasure passed through many hands: CV Productions (1979) to WOW Promotions (1993) to SEG Entertainment (1995) to Zuffa (2001-present). If MMA wants to be considered the crown jewel, then the UFC should treat MMA’s history as a priceless commodity; handle it with the same reverence as boxing, baseball, football and all the other great American institutions have. Major League Baseball has made mistakes, gaffes, and errors along the way, but they amend their books. Will the UFC do the same? They certainly aren’t obligated to, MMA is a free market, but they are the 800 pound gorilla and the world is watching. The UFC can’t be expected to honor competitors or rivals, but CV Productions pre-dates them. That in and of its self gives them a pass, the opportunity to do the right thing and say yeah, those guys really were pioneers. While Royce Gracie will always be remembered as the Babe Ruth of MMA, a group of spirited men “existed” and played a role before those stars were born. They also deserve a permanent place in the annals of history. It’s never been a question of White’s acumen; he and the Fertitta brothers are the reason MMA is cash cow. Like Thomas Edison’s claim to fame, they didn’t invent the light bulb; they just knew how to sell it—Capitalism at its finest. But 100 years from now, will fans remember the history of “MMA” or just Dana Doubleday’s UFC? It may be of little consequence now, but the Alexander Cartwrights of mixed martial arts should be given respect and recognition before it’s too late. 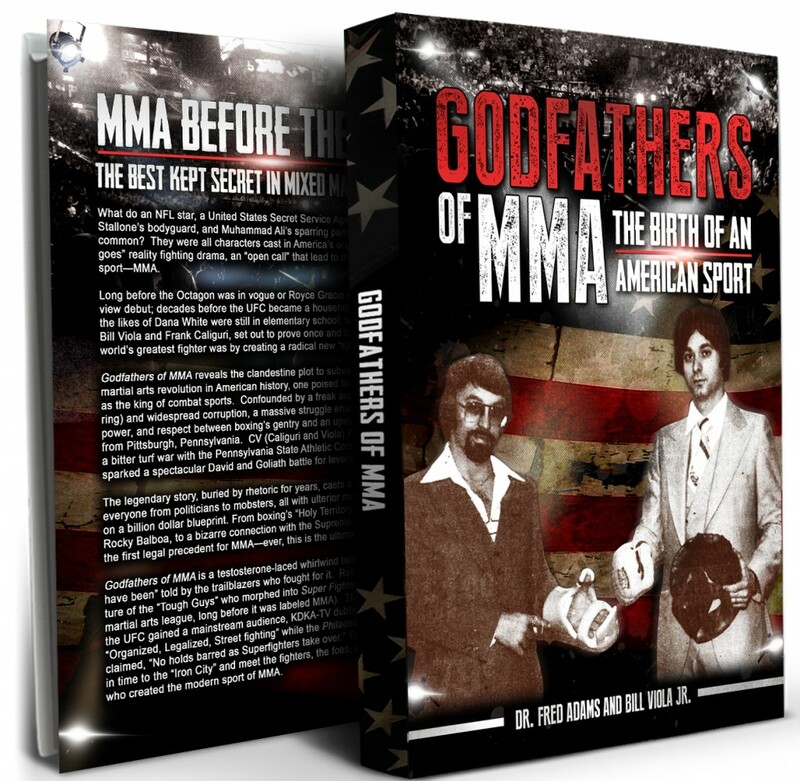 Meet the true Godfathers of MMA. Most mixed martial arts fans simply aren’t concerned with revisionist history, but we still have a duty to preserve the integrity of sport. Note “sport” is a very specific label not to be confused with methodology, training, or brutal contests that would include an analysis of Pankration, Vale Tudo, and any number of distant relatives that inspired modern MMA competition in the United States (long before we knew it as mixed martial arts). The “invention” of mixing martial arts dates back to the rise of humanity, but the “creation” of an American sport has direct lineage. The field of pioneers runs deep including everyone from Bruce Lee to “Judo” Gene LeBell setting the tone with exhibitions and challenges, but their contributions, although groundbreaking, do not constitute an “open” regulated sport. Like stick-and-ball games, baseball didn’t become a sport until the emergence of a diamond, 3 strikes and 4 bases and MMA is no different. While the UFC popularized the idea of MMA, the “sport” was created a decade earlier (MMA’s best kept secret). CV Productions provided the blueprint for a multi-billion dollar business in 1979; the first league of its kind with no pay-per-view or the internet to spread their message. The Super Fighters revolution was repressed, now passed off as mere urban legend, but it’s time to look past the fairy tale version you’ve been brainwashed to believe—UFC’s Maiden Voyage. Art Davie thought he had entered uncharted waters in 1993 when he created the Ultimate Fighting Championship, but another ship set sail years before him. Davie planted his flag in Denver, Colorado thinking he had discovered new land, but in reality MMA’s story began in Pittsburgh, Pennsylvania more than a decade earlier. It’s not up for debate; there is overwhelming evidence that a UFC-esque promotion thrived before Rorion Gracie and Art Davie collaborated. CV Productions was a premonition of the Zuffa era, built as sport from the ground up, while UFC 1 was devised as a spectacle, slowly transforming to sport over time. The former isolated in Pennsylvania, the latter seen in every major market in America. One forgotten, the other larger than life. Most media outlets tell us, “Mixed martial arts competitions were introduced in the United States with the first Ultimate Fighting Championship (UFC) in 1993.” This just isn’t true; a major milestone yes, but a major misnomer. They, the press, got it wrong in ‘93 and have been wearing blinders ever since. A more accurate description might have been, no-holds-barred competitions were introduced in the United States with the first UFC but the modern sport of mixed martial began under the banner of CV Productions. Too late, once the ripple effect set in (print, reprint, reprint) the UFC became the first of its kind. Positive or negative press, the public is prone to believe what news they hear first. Ask any politician who’s been on the wrong end of a juicy scandal; truth becomes relative depending which way the press leans. It’s equally hard to buck that trend if you are an inventor or explorer playing catch up. The perception of the UFC and CV Productions is very much in line with Christopher Columbus and Leif Eriksson. While the Vikings didn’t have a clever rhyme, Columbus did, sailing the ocean blue in 1492. The Ultimate Fighting Championship’s ploy of course was shock and awe, broadcast live and in bloody color. UFC, like Columbus, won the media’s attention and was accepted into an exclusive club with “lifetime” membership—pop culture. The New World may have been discovered 500 years before Columbus was born, but once America makes up her mind she is stubborn. Today, CV Production’s “anything goes” creation has evolved into one of the fastest growing sports in the world, albeit under the auspices of the Ultimate Fighting Championships. Nearly thirty years before the UFC garnered real mainstream acceptance, CV set up shop as the first mixed martial arts company in American history. Although enshrined at Heinz History Center in association with the Smithsonian Institution, you’ve likely never heard of them—until now. MMA is the sport of the 21st century: WOW Promotions popularized it, SEG Entertainment refined it, Zuffa LLC monetized it, but CV Productions created it. This is your exclusive ticket to travel back in time and relive the epic journey of the Godfathers of MMA. Bill Viola Jr. is a Pittsburgh, PA based author, producer, and martial artist. 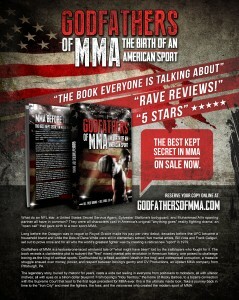 His latest book, Godfathers of MMA, is now available. A legitimate jab at boxing--the league was hand built to compete them at the box office. It’s a shame it played out the way it did. They [Caliguri and Viola] were obviously ahead of their time. These guys came within an eyelash of a billion dollar payday. The UFC owes Pennsylvania politicians a big pat on the back because without them, they wouldn’t be in business today. Incredible to think a mixed martial arts revolution began in 1979... we just didn't know about it. September 11, 2014 , No Responses. Who is the father of MMA?